Closest full-range resort from New Chitose Airport. Your resort vacation begins the minute you enter our area. Easy access to the resort from 3 Airports! Located at the center of Hokkaido, Tomamu is the perfect location for your base. Only 5 minutes distance from Station to Front Lobby! 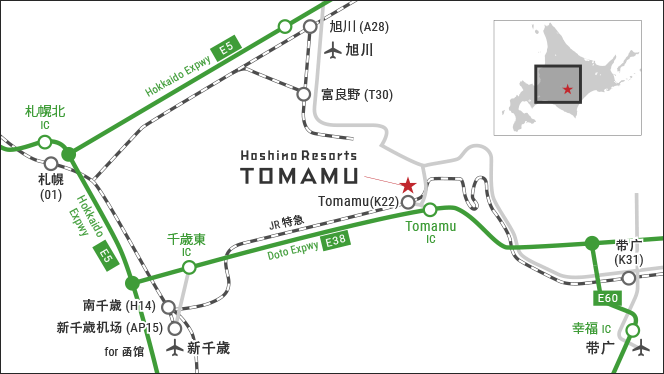 The shuttle bus between Tomamu station and Resorts will be waiting in front of Tomamu station when you arrive there. From Asahikawa/Furano, please consider driving for the quickest route. Longer route expected by train. 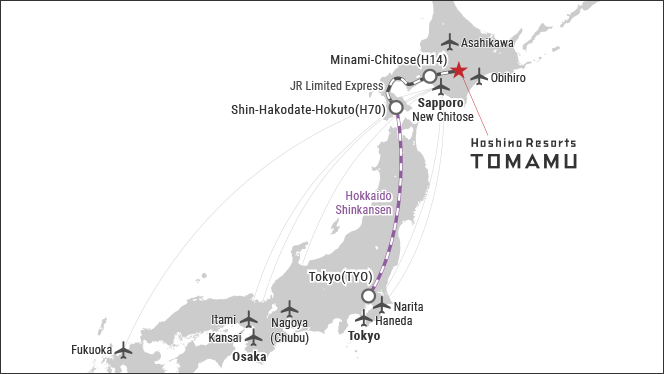 Take the ‘Rapid Airport’ bound for Sapporo or Otaru at New Chitose Airport to Minami-Chitose and change there to ‘Limited Express Super Ozora/Super Tokachi’ bound for Kushiro/Obihiro station. 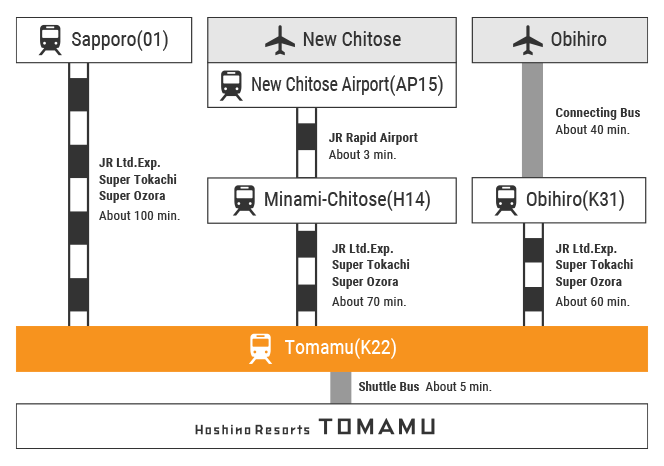 The ‘Rapid airport’ runs four times in an hour and it takes approximately 3 minutes from New Chitose Airport station to Minami-Chitose station. * JR Tomamu Station is a unmanned station. Please purchase return tickets in advance. Only 5 minutes from Tomamu I.C. 100 mins. from "Sapporo-Kita Interchange" to Tomamu on the Doto Expressway. Exit the expressway at "Tomamu Exit" and 5 minutes drive to Hoshino Resorts Tomamu. 90 minute drive from "Chitose-Higashi Interchange" to Tomamu on the Doto Expressway. 3 hours drive from Asahikawa via Local roads. 90 minute drive from central Furano via Route 38. 60 minute drive from "Otofuke-Obihiro Interchange" to Tomamu on the Doto Expressway. SkyExpress provides safe and hassle-free door-to-door charted transfer services for international and domestic tourists in Hokkaido, Japan. Guests enjoy its timely and polite service as well as its modern fleet of vehicles which is renewed each year. SkyExpress meets all international and domestic flights and offers a meet and greet service at the airport. SkyExpress also picks up guests directly from their accommodation to get to the airport in a safe and timely fashion. As tourism in Hokkaido continues to grow demand for transfer services does too and SkyExpress continues to expand its fleet to service a wide range of guests. Get to Tomamu in comfort and on time with SkyExpress.